Lutherans For Life | Does Disability Warrant Abortion or Assisted Suicide? Does Disability Warrant Abortion or Assisted Suicide? 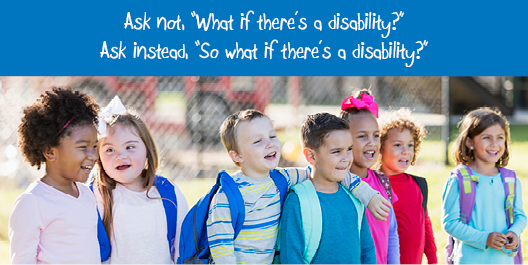 What if there’s a disability? Some supporters of abortion use disability to justify it. Advocates of assisted suicide often do too. Disabilities can present challenges for the persons who have them. Certain conditions do cut lifespans. They might bring about death, even before birth or shortly after. All of these concerns can cause difficulties and suffering for the patients’ loved ones. We must not dismiss the weight of the fears and griefs they face. So, should we sanction abortion or assisted suicide for their situations? May we decriminalize the ending of lives in order to avoid their afflictions? Does disability constitute a capital offense? Are deadly measures the only remedies available for disability? Are they even the best responses? How do abortion access and poison prescriptions make things better for persons with disabilities, especially the ones who desire to survive? We rejoice that disability does not diminish a person’s worth. What we are—not what we do—gives us our value. Persons who exhibit less-than-average intelligence do not have an inferior humanity because of it. Greater strength, skill, insight, or attractiveness does not get one twice the rights. Those who develop injuries or disorders do not suddenly become a fraction of their former self. Individuals with only one arm or ear or lung or leg—or none at all—still possess genetic membership in this particular species. They still possess Almighty God’s own image just as much as anybody with enough bones or extra organs. Jesus explicitly welcomed and intentionally affirmed visibly broken folks in His earthly ministry. He did it to indicate that none of us can accomplish anything apart from His grace, but that by abiding in Him, anyone can bear abundant fruit. The same fallenness that manifests in physical limitations affects us all. He also incarnated disabilities and endured deformities in His crucifixion (“He took our illnesses and bore our diseases” Matthew 8:17) to declare and demonstrate how God cherishes even the least of these as precious treasures. This gives purpose to our every pain (“but that the works of God might be displayed” John 9:3b), as He perfects His power precisely in human weakness (2 Corinthians 12:9). In fact, He specifically selects what is foolish and weak, what is low and despised (1 Corinthians 1:27-28) to prove His saving strength (2 Corinthians 4:7-10). Most persons with disabilities appreciate and enjoy their lives. Their families feel grateful to know them and have them and love them. Doctors regularly misdiagnose, but no medical professional can undo a death. Many disabilities and deformities do not turn out as challenging as feared. Living with disability can actually offer advantages. It motivates us to compassion and cooperation. It provides unique and otherwise overlooked perspectives on life and relationships. On the other hand, using death to deal with adversity multiplies misery. Getting rid of a person cheaply imitates getting rid of a problem. Getting rid of a problem poorly substitutes for getting to a solution. Research suggests that abortions due to disability or deformity increase the degree of post-abortion grief and guilt. Allowing physician-assisted suicide imposes a societal expectation that pressures persons with disabilities, terminal diagnoses, or depression to take their own lives. Which injuries, emotional disorders, or behavior stresses qualify for extermination, and which don’t? Would laws limit abortions and assisted suicides only to circumstances of disability? (Spoiler alert: they haven’t.) What distinguishes a disability from just another difference? What other differences between individuals would we find unacceptable? Is it only a coincidence that Planned Parenthood arose out of this kind of ideology, called eugenics? Ought we not take caution that this discredited pseudo-science inspired the Holocaust? A disability may describe a person, but it never defines that person. And God’s involvement, love’s involvement, redefines and redeems both disability and humanity. It likely will not grant us all the answers we seek, but His Gospel of forgiveness and resurrection in Jesus Christ offers the answer we need—the answer to disability, to disease, to discomfort of all kinds, and to death itself. In His hand every unknown opens space for hope. Miracles only fit where men fail.